Three summer festivals collide this weekend in downtown Coeur d’Alene in a three-day extravaganza of food, shopping, music and art. 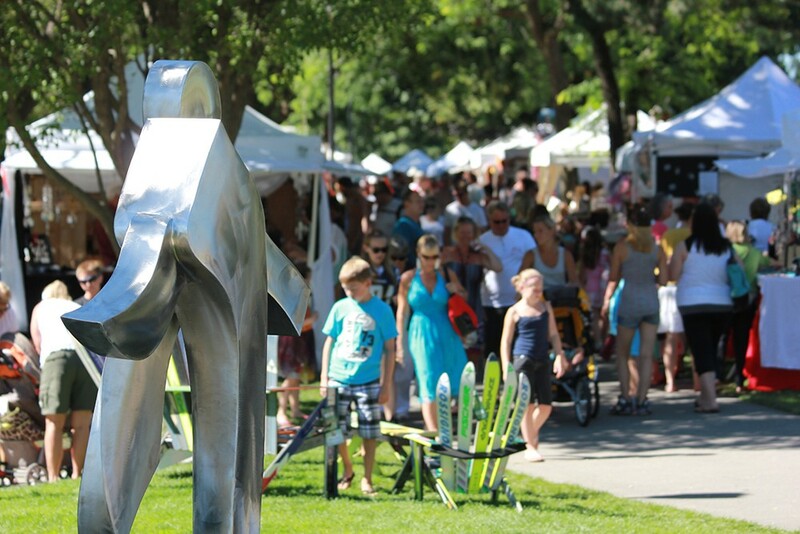 Over 400 vendors will congregate in the city by the lake during ART ON THE GREEN, TASTE OF COEUR D’ALENE and the COEUR D’ALENE STREET FAIR on Aug. 3, 4 and 5. ART ON THE GREEN, a festival of all things creative, turns 50 this year. This annual celebration of the arts showcases the work of hundreds of artists and musicians on the North Idaho College campus. Browse booths featuring handcrafted works in glass, clay, leather, wood and metal, not to mention a multitude of beautifully colored canvases. Children will appreciate making their own works of art (materials and instruction provided) and adults can test out the “liquid” art at the beer and wine garden on site or listen to music at one of the many outdoor stages. Fri, noon-7:30pm; Sat, 10 am-7:30 pm; Sun, 10 am-5 pm; North Idaho College. Head to Sherman Avenue and you’re sure to see more creativity on display at the 28th annual DOWNTOWN STREET FAIR. Retailers will take over the street with an endless display of tents and tables. If you don’t see what you like at the first couple booths, keep walking — there will be 250 of them. Fri-Sat, 10 am-8 pm; Sun, 10 am-5 pm; Sherman Ave.; downtown Coeur d’Alene. When it’s time to eat, then head to City Park and the TASTE OF COEUR D’ALENE festival, where you can choose from over 100 different vendors offering food and drink. Whether you’re in the mood for a good ol’ fashioned funnel cake or something more gourmet, this festival has you covered. Live music and beer garden featuring local brews are also on tap. Fri, noon-8:30 pm; Sat, 10 am-8:30 pm; Sun, 10 am-5 pm; Coeur d’Alene City Park. There are no admission fees to all three festivals. All events are within walking distance, but a free shuttle is also available for those who want stress-free travel between them. Come twist and shout as the Isley Brothers make way to the Coeur d’Alene Casino stage. The group, known for their songs “Twist and Shout” and “This Little Heart of Mine,” boasts 10 songs that hit the top Billboard charts and 16 albums that hit the top 40. Tickets $35+, 7-9 pm, Coeur d’Alene Casino. The Powers rock the boat this week during the Bands on Boats summer concert series on Lake Coeur d’Alene. Tickets $25, ages 21+, 7-8:30 pm, depart from the Coeur d’Alene Resort. A good time is brewin’ at McKeuen Park when more than two dozen breweries and cideries take over the park to support the North Idaho Centennial Trail Foundation. Enjoy live music by the Rub, while you sample some of the region’s best craft beer. Tickets $30 include six sample pours (5 oz. ); 2-8 pm; McKeuen Park; alesforthetrail.org.